Boil, steam or roast the potatoes until just tender, drain and set aside until cool enough to handle. Halve and use the handle end of a teaspoon to make a little indentation into the flesh of the cooked potato. Save any scraps of potato to mix into the filling. 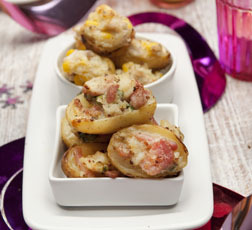 Mix together your chosen filling (see below) and use a teaspoon to top each potato with a little filling. Preheat the oven to 200C (400F) mark 6. Place the potatoes in an oiled oven tray. Cook uncovered, for about 15-20 minutes or until golden brown and hot, remove and serve warm. Turkey and Corn ToppingCombine the reserved potato flesh with the chopped turkey meat and remaining ingredients in a medium bowl. Spoon the filling onto the potatoes. Continue as instructed above. Bacon and Cheese ToppingCook the bacon in a large frying pan until crisp, drain on kitchen paper and chop finely. Add the reserved potato flesh in a medium bowl with butter, mustard, half the cheese and sour cream; stir in bacon and spring onions. Season with black pepper. Spoon the filling onto the potatoes; sprinkle with the remaining grated cheese. Continue as instructed above. A delicious, quick and easy recipe for sea bass which is good for using up leftover single cream and lemon.